1) Will Kishore be able to execute the plans successfully? Is the current period a favourable one for him? Jupiter will be transiting over his Natal Rahu in the Sign of Leo, it will be aspecting his Ketu in Aquarius, till 11th August, 2016 in his Solar Chart. Rahu will be transiting over his Natal Mars in Virgo, till 30th January, 2016. After that Rahu-Ketu will begin their journey over his Natal Rahu-Ketu in the Sign of Leo and Aquarius respectively. Saturn will be aspecting his Natal Saturn and Jupiter in Capricorns, it will also be aspecting his Natal Rahu, till January 2017 . Ganesha observes that the current transitory influences are not much in favour of Kishore. The decisions taken by him till 30th January, 2016 may not be entirely beneficial for him. The steps or decisions taken in this period may compel him to make modifications later on. The planets do not seem to be too supportive for some new enterprises or initiatives. It seems that the current time frame is not fortunate for him. He may find his plans progressing in the right direction post 11th August, 2016, the time when Jupiter will be transiting through the Sign of Virgo in his Solar Chart. 2) How will the Future Group fare in the year ahead? Rahu will be transiting over his Natal Mars in Virgo, till 30th January, 2016. After that Rahu will be transiting over his Natal Rahu post 30th January, 2016. Ketu will be transiting over his Natal Ketu during this time frame. Saturn will be aspecting his Saturn and Jupiter in the Capricorn Sign, it will also be aspecting his Rahu, till January 2017. Ganesha notes that the year ahead may not have too many goodies in store for Kishore Biyani. 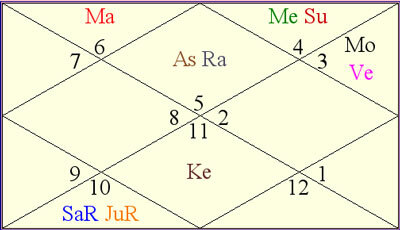 Due to the positive influence of the expansive Jupiter, Kishore will come up with multiple innovative ideas and busines concepts, but owing to the negative effects of malefics – Saturn, Rahu and Ketu and their collective restrictive forces, the ideas and desires may not manifest into reality in the upcoming year. Ganesha advises Kishore to focus more on consolidation and to revive the existing operationsal areas. The period post 30th January, 2016 may bring along great uncertainty. Commercial success and financial fluidity may get affected. Kishore Biyani as the CEO, if is hell-bent on implementing new ideas and plans, then he may have to compromise on various issues during the year ahead. The progress of the venture and the response of the public may pick up slowly, but steadily. Despite all the negative influences currently, the future of the Future Group is very bright, says Ganesha. 3) Any threats or opportunities in store for both Kishore and Future Group? Saturn's influence on his Natal Saturn and Jupiter and also Rahu till January 2017. Ganesha finds that this may give side effect to the other group of companies controlled or looked after by Kishore Biyani. The overall professional impact/performance may not be very positive for the business related matters till January,2017. The transit of Saturn may create delays and result in slow progress. Transit of Rahu may be creating financial difficulties and mismanagement till 30th January ,2016. In short the new venture /idea may take longer period that what has been expected by the group CEO. Ganesha foresees a path laden with some uncertainties, obstacles and delays for Kishore and even the Future Group. The problems that await Kishore are the slow response from the partners in collabaration with which the Future Group is planning to launch new services, financial constraints and disinterest of investors, delay in the launch of projects and some organisational issues. The period post August 2016 is comparatively a much brighter one. The mighty Jupiter will pave the way for exceptional success then. It is better if Kishore takes more time and consider more points to be included in the up-gradation plan. Venus represents design, aesthetics and the urban-class. Currently as Rahu-Ketu are in a square position to Kishore's Natal Venus, his plans regarding the design-upgrade and efforts to connect better with urban and high-class customers may not fructify, and post January 2016, there will be better ideas and concepts that will come up. Mars represents the will to execute a plan or an idea. Mars also represents fixed assets, machinery and land. And, even these areas may be under a cloud currently. Come August 2016 and see things working out smoothly, Ganesha tells Kishore on a conclusive note! Ganesha wishes a great time ahead to Kishore Biyani.